Normandy Gite Holidays is a 3 bedroom gite sleeping 6 people plus a baby. Well behaved dogs agreed at the time of booking are welcome. The gite is spacious and contemporary and is set in the countryside. The nearest village is Gavray in La Manche region of Normandy. It’s around 75 minutes to the ports of Caen Ouistreham, 80 minutes to Cherbourg and 90 minutes to St Malo. The gite is contemporary, spacious and comfortably sleeps 6 people plus a baby in 3 bedrooms. The building was bought in March 2014 and had been used as a stable by the previous owners. The main owner’s house is across the courtyard but the gite is not overlooked and your privacy is assured. The extensive renovation project took place during 2015. The original beams have been left exposed and contrast with the clean lines of the light, airy space. The original barn doors have been replaced with a wall of glass allowing natural light to flood into the large entrance foyer. To one side of the foyer is the lounge with a door leading out onto the patio and garden. Guests can relax with a book from the bookshelves, watch English or French TV or simply chat to friends or family. On the opposite side of the foyer is the kitchen and dining area. The kitchen is well equipped and the dining area seats 6 people comfortably. This is a very sociable space for entertaining friends and family. A downstairs utility room completes the downstairs. In here is the boiler, washing machine, a toilet and small hand basin. Upstairs, a generous and relaxing master bedroom with king sized bed and ensuite shower room awaits. Two further bedrooms which can either be twin or superking rooms, share a tastefully decorated shower room. This provides you with complete flexibility. The shower room is accessed from the upstairs landing. It is not a Jack and Jill bathroom. Central heating throughout the gite and a woodburning stove in the lounge ensure it is available all year round. There are some outdoor games and toys as well as jigsaw puzzles, packs of cards, books and DVDs. For younger members of the family, there’s a toy trunk full of indoor toys and games. A travel cot is available and we would ask that you provide your own bedding. A high chair and a stairgate can also be added on request. Please note that the stairgate can only be added to the top of the stairs. A jug blender, hand blender, plastic beakers, plates, bowls and cutlery can be found in the kitchen. To the front of the gite is the courtyard with ample car parking. A small table and two chairs are situated on the front courtyard. To the rear of the property is a fenced garden. The garden is accessed through the lounge or via a side gate from the front of the gite. The garden slopes slightly. Two sides are fenced, one side has a hedge for a boundary and the remaining side is made up of a hedge and the gite itself. There is a gravelled patio area with tables and chairs to seat 6 people. Between the lawned are and the gravelled area are flower beds. There is a BBQ for guests to use. The gite is just a couple of minutes drive from Gavray which is in La Manche region of Normandy. Gavray is a large and pretty village with a market on Wednesday and Saturday mornings. On Wednesdays the cattle market sits alongside a number of stalls selling local fruit and vegetables. The Saturday morning market is much bigger, and, as well as fruit and vegetables, you can also purchase cheese, shellfish, fish and bread. Other stalls sell plants, leather goods, clothes and shoes. There are also a couple of rotisserie vans who do a roaring trade in freshly grilled meats and chips. Gavray has a supermarket and 3 boulangeries for delicious bread, pastries, cakes and sandwiches. The supermarket also sells petrol. You’ll also find a number of bars and restaurants where you can buy a coffee or spend more time relaxing over a meal. A butchers, pharmacy, post office, beauty salon, library, several banks and the tourist office are just some of the other facilities in Gavray. 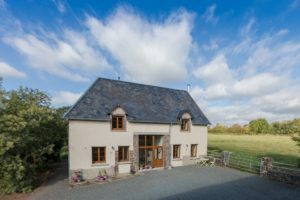 Equidistant from the larger towns of Coutances, Granville and Villedieu-les-Poêles, this is the ideal base from which you can explore the area. The nearest beach is just 15 km/9 miles away at Saint Martin de Bréhal and the ruins of Hambye Abbey are just a short drive away. There are plenty of bars and restaurants, markets and food producers in the area for you to taste Normandy delights such as Calvados (apple brandy), cider, caramel sauce, cheese and sweet biscuits. A visit to Normandy would not be complete without a trip to Mont St Michel, the UNESCO world heritage site, which is 50 minutes away. Bayeux and the D-Day landing beaches are also worthwhile day trips. With abbeys, churches, historical buildings, beaches, cycling, horseriding, gardens and gastronomic delights, Normandy has plenty to entertain you. There are a wide range of tourist information leaflets about the local area in the gite. These are renewed every year so are always current. I also post on the website about the local here. Click the links for my Insider’s Guide to Normandy, an in-depth guide to Mont-Saint-Michel, a look at the D-Day landing sites and what to do in Medieval Bayeux. You can also check out the Facebook page here. I’m Chris and I moved to Normandy in 2014 to undertake a barn renovation project. This is a complete lifestyle change having previously lived and worked in London. I have obviously watched too many property renovations on TV. Many years ago, as a student, I worked in France and therefore had a reasonable grasp of the language. I have become involved in the local community and made both French and English friends. My Normandy neighbours have been very welcoming and friendly. Now that the barn renovation is complete, I’m looking forward to welcoming guests to the gite and sharing this wonderful part of Normandy with you. Hopefully you will make some holiday memories that will last a lifetime. The ferry ports of Caen Ouistreham (1 hour) and Cherbourg (1.5 hours) are both served by Brittany Ferries. Check the Brittany Ferries website for routes and timetables. You can book the gite via Brittany Ferries sister site, Holiday France Direct, and also receive a 20% discount on your ferry. Other options include alternative ferry companies, flights, the Channel Tunnel and coach. The Normandy Tourist Board website details the available options. The nearest airports are at Rennes and Caen (around an hour or so away). Trains from Paris stop at Villedieu-les-Poêles and Granville. Map showing the location of Normandy Gite Holidays. Living in Normandy is a complete lifestyle change for me. There is a real community feel here and people are very welcoming and friendly. I've loved discovering and exploring Normandy and hope you will too. Copyright © 2019 Normandy Gite Holidays. Powered by WordPress. Theme: Accelerate by ThemeGrill.